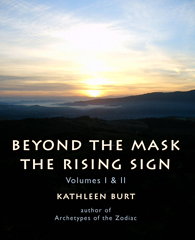 Well known and respected internationally for her ground breaking work in Archetypes of the Zodiac, Kathleen Burt now offers us a phenomenal distillation of her life work in: Beyond the Mask: The Rising Sign – Part 1 & Part 2. Midlife urgings bring forth cycles of death and rebirth. Antiquated identities and roles must die, old ‘masks’ must be pealed away before we can discover a new path in life. Kathleen Burt addresses specifically how the twelve rising sign patterns guide us into new life and fresh experiences. With the keen eye of an astrologer examining the biography of creative writers and inspired people, Kathleen Burt brings a depth of understanding to the Rising Sign. This unique volume of wisdom offers decades of scholarly study and practical experience in esoteric astrology, psychology, mythology, and biography and examines the underlying archetypal patterns inherent in our lives. An astrologer in private practice for 30 years, Kathleen Burt is the author of Archetypes of the Zodiac, a book about Sun Signs from the perspectives of mythology, psychology, and esoteric astrology, and the phenomenal distillation of her life work, Beyond the Mask: The Rising Sign. A Fulbright scholar to India, Kathleen completed her graduate work in South Asian history at the University of Chicago. She has taught at Roosevelt University, Chicago and Mira Costa College in CA. Patterns in Health, a two-year program on archetypes, dreams, ritual and Active Imagination led by Jungian analysts has influenced her life and client work. She currently teaches Viniyoga classes (sequencing and breathwork) in the tradition of T.K.V. Desikachar.